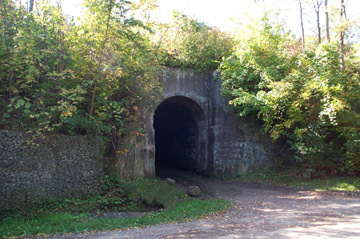 The tunnel was built under what is now the main Canadian National Railway line and was to allow for road access to either side of the new railway without having to climb up and over the tracks. 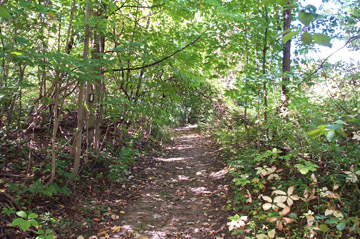 The tunnel is said by some sources to be for a railway that was never built and was planned to run parallel to the Welland Canal. 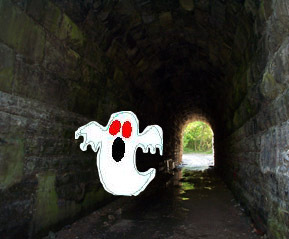 The tunnel is too narrow for a railway; click on Blue Ghost Tunnel to see an actual railway tunnel of the time. 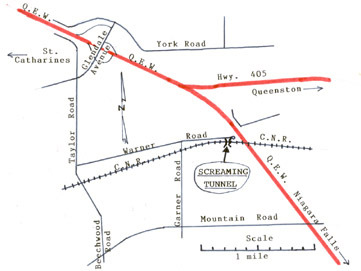 It is difficult to visualise where a railway would have gone on the south side of the tunnel where there is a relatively steep slope. Regardless, no railway was ever built, and the tunnel is still there. Please don't write to tell me that "It ain't true." I already said it is a legend . . . .
Mike and Robert visited the "Screaming Tunnel" during the March Break, 2008. No screaming was heard, except for the assorted screams and hoots made by the boys. The ghost must have been on "March Break" as well. 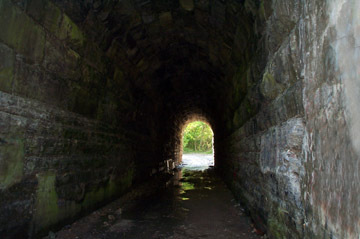 Even on a bright, sunny day this tunnel has an eerie feeling about it that is difficult to elaborate on. 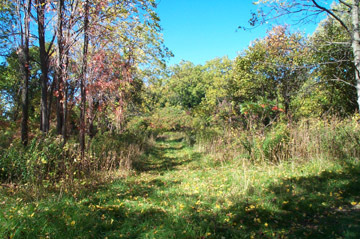 Please check the map above and visit the tunnel yourself. 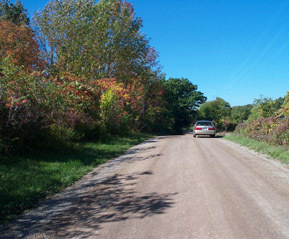 Try http://uk.yahoo.com or http://www.google.com and search for "screaming tunnel".